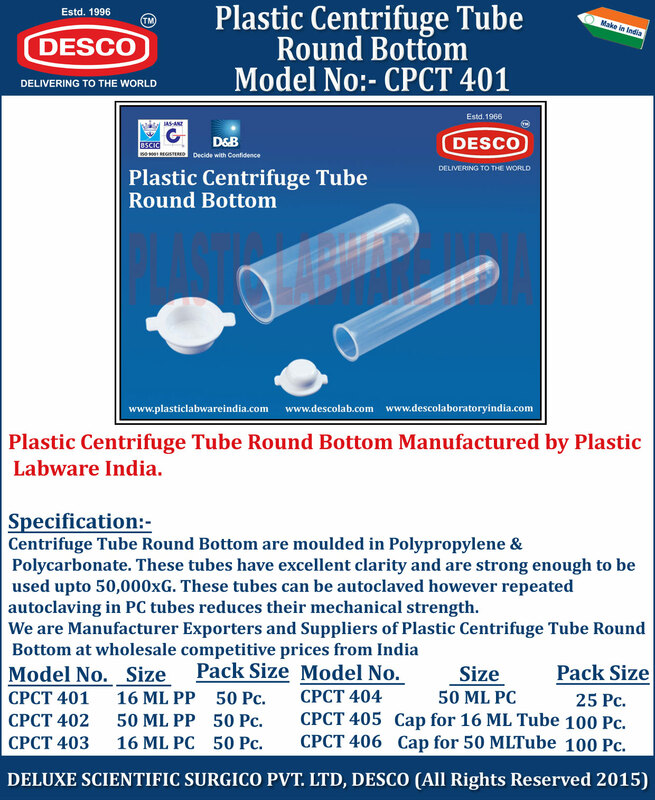 Centrifuge Tube Round Bottom are moulded in Polypropylene & Polycarbonate. These tubes have excellent clarity and are strong enough to be used upto 50,000xG. These tubes can be autoclaved however repeated autoclaving in PC tubes reduces their mechanical strength. We are Manufacturer Exporters and Suppliers of Plastic Centrifuge Tube Round Bottom at wholesale competitive prices from India. CPCT 401 16 ML PP 50 Pc. CPCT 402 50 ML PP 50 Pc. CPCT 403 16 ML PC 50 Pc. CPCT 404 50 ML PC 25 Pc. CPCT 405 Cap for 16 ML Tube 100 Pc. CPCT 406 Cap for 50 MLTube 100 Pc.